Protests, Strikes Across France Disrupt Travel, Schools - Integration Through Media ....! 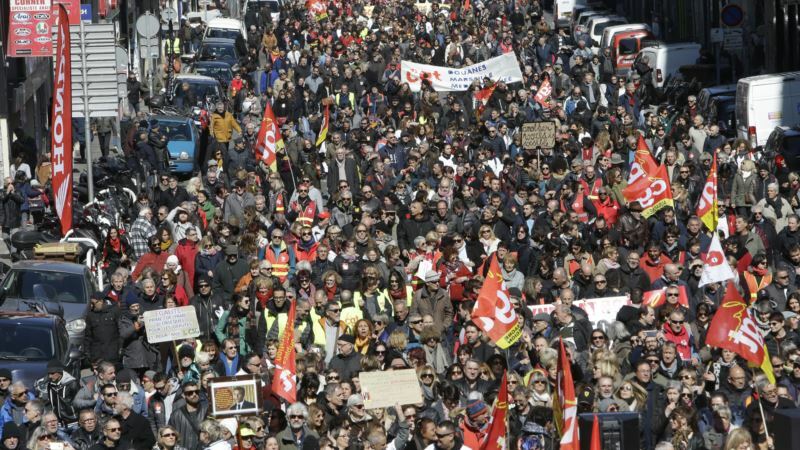 (VOA): Trains, planes, schools and other public services across France were seriously disrupted Thursday as unions set up dozens of street protests across the country. In the western city of Nantes, brief scuffles broke out between some protesters and riot police using water cannons. Airport authorities say 30 percent of flights to and from Paris are canceled. National train company SNCF says only 40 percent of high-speed trains and half of regional trains are running. Some schools and kindergarten were also closed. Strikers were answering the call of seven French unions to reject President Emmanuel Macron's economic measures. Union leaders said the strikes were a warning to the government. “We agree that we need to makes changes to public services, but not to restrain them. To improve them. We need more public servants,” Philippe Martinez, secretary general of the CGT union, told FranceInfo radio. “If we are not heard … there would be calls for strikes and in that case, very few trains would run,” said Julien Cabanne, a union official who came to Paris to protest. SNCF unions have already scheduled a series of strikes in April, May and June. The main protest in Paris was scheduled to start Thursday afternoon. The Paris Metro is running normally, but suburban trains were affected by the strike. Nirman Djeacoumaran, who lives in the Paris suburbs, told the AP there was just one train per hour on his train line. At Paris Orly airport, passenger Noemie Danican had just learned her EasyJet flight to Toulouse, in southern France, was cancelled. “I have no idea what's going to happen. This is going to be very difficult. Very very difficult,” she said.